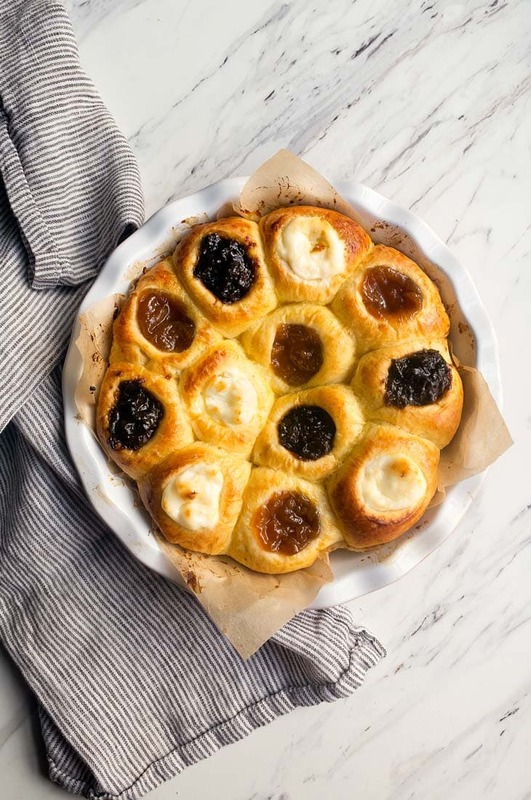 Authentic Czech kolaches recipe—made with apricot, cream cheese, or prune filling. Small batch, makes 12 small kolaches. I just found out that my parents used to host Thanksgiving breakfast and Thanksgiving dinner. I know I was around for all of it, but I don’t have any memories of just how many kolaches I could shove in my mouth as a kid. The primary reason they served two meals on Thanksgiving day is because my grandparents and great aunt would arrive early to help with all of the prep work. Since my great aunt owned a restaurant (I know I’ve talked about this before), they were happy to give her a much-needed break. There’s something sweet and meaningful about feeding someone who normally spends their day cooking and feeding so many people. Since my grandparents are Czech, I’ve always grown up around authentic Czech kolaches. If you’ve never had a kolache (pronounced KOE-lah-cha…don’t say ‘koe-lah-CHEE around me, please), it’s similar to a soft, egg-y, buttery brioche roll with a fruit filling on top. The most common flavors are: prune, poppy seed, cream cheese, and apricot. I’ve also seen blueberry, cherry, and lemon. I’m willing to talk about savory kolaches with eggs, bacon and sausage, but honestly, I didn’t grow up on those. Someone can correct me if I’m wrong, but I think the savory versions exist only in kolache shops. In all of my research for Czech recipes, I have never found a recipe written by someone’s grandmother for sausage or egg-stuffed kolaches. But I could be wrong. My family is from Moravia in the Czech Republic; maybe other Czechs have savory ones? Let me know if I’m wrong. Anyway, I scaled this recipe down from one that my grandmother clipped out of an old newspaper. I’m assuming she used this recipe because it was a smaller batch than most kolache recipes. The truth is, my grandmother was the original one to scale down desserts. I inherited a mini 6″ pie dish from her. She would frequently halve cake recipes to bake in smaller pans. She liked to make a half-batch of cake in an 8×8 pan instead of a 9×13 pan. I’m not sure if it was because she was just cooking for herself and my grandfather, or if it was one of those leftover Depression-era traits, where an entire cake seemed so wasteful, but you should know that Dessert for Two comes from a very honest place. It’s in my blood to make tiny desserts. I wasn’t privy to my grandmother’s small-batch desserts when I was younger, but I’m very aware of it now. Every day that I wake up and have the unbelievable privilege of scaling down desserts as my actual job, I think about her. It all just makes sense to me, why I’m here doing what I’m doing, you know? It’s a good feeling. Anyway, DOUGH. Let’s talk about kolaches. The best description of the dough is like challah…but richer! Kolache dough has loads of butter, eggs and milk. It’s pretty frickin’ glorious stuff. When you’re kneading the dough (just 10 minutes, I promise), the dough is supple and fun to work with. Honestly, I made this entire recipe in 90 minutes. I used the ‘proof’ setting on my oven, and both rises happened in roughly 30 minutes. Which brings me to a very important point: a lot of people think Czech kolaches needs at least 3 rises to be ‘authentic.’ This recipe has 3 rises, technically, since I activate the yeast with a portion of the flour. I’ve come across recipes with 5 rises, and well, that sounds great, but this recipe is pretty dang authentic. So, save yourself the time. I like to make a pan of these and alternate flavors (4 of each: cream cheese, prune, and apricot), but feel free to triple one filling recipe to make an entire pan of one flavor. To make the prune filling, I cooked dried prunes and honey until they were soft and mashable. For the apricot, I used a jar of very thick preserves. You don’t want to use jelly or thin jam for kolaches because they tend to boil in the oven. Cooked dried fruit or very thick preserves are the best things to use. My favorite kolache is prune (but poppy seed is a close second). If you’re a kolache virgin, you’re going to want to start with the cream cheese–trust me on this. I posted a photo of these babies on instagram, and immediately, someone asked about the posipka (a very fine crumbly little mixture of flour, butter and sugar that’s sprinkled on top of kolaches before baking). Admittedly, I love posipka, but I left it off for the sake of simplicity. I didn’t want to dirty another bowl. But to the person who called me out on posipka, you’re an amazing human, and you really know your kolaches! Bravo! 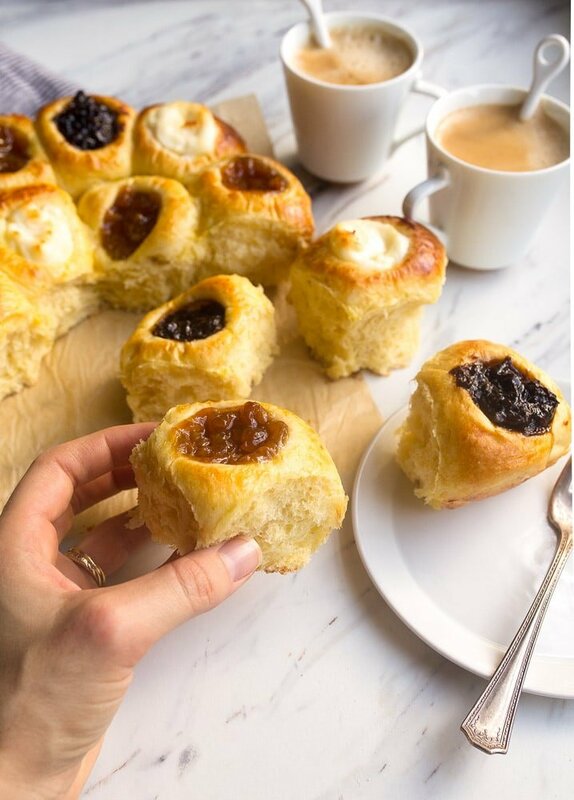 Ok, I’m sharing my recipe for Czech kolaches below. The recipe makes 12 small kolaches in a regular 9″ pie plate. The recipe is very easily halved, if 12 kolaches is just too much for you–I totally get it. If you cut the recipe in half, bake the rolls in a 6″ pie dish instead. Happy baking! Errrr, I should probably say Šťastné pečení! Authentic Czech Kolaches recipe, makes 12 small kolaches. First: make the 3 different fillings. If you want all of the kolaches to have the same flavor, triple one of the filling recipes. For the prune filling: combine the prunes in a small saucepan with the honey, and add enough water to barely cover the prunes. Boil, stirring occasionally, for about 10 minutes. Mash them with a fork as they cook. They're done when most of the water is evaporated and it's thicker than jam. Set aside to cool. For the apricot filling: no work necessary! Just have the apricot preserves ready in a small bowl. For the cream cheese filling: stir together the room temp cream cheese with the powdered sugar until smooth. Set aside. Next, make the kolaches: warm the milk in a microwave-safe bowl for about 30 seconds until lukewarm. The target temperature is 110 degrees. Once it's at precisely 110, add the yeast, sugar and 2/3 cup of the flour. Mix together well and let rise in a warm place until doubled in size. In another bowl, add the melted butter. Let cool briefly before stirring in the egg yolk. Add this to the yeast mixture and mix well. Add the remaining flour, salt, and mix very well well. Next, knead the dough for 10 minutes: The best way to knead is to smear the dough away from you with the heel of your hand, and then fold the dough back onto itself from the side with your other hand. Lightly flour the board and your hands as you go. At the end of 10 minutes, the dough will be soft, supple, and not sticky at all. Grease a bowl with cooking spray and add the dough. Cover and let it rise in a warm place until it doubles in size (you can do this in the oven using the 'proof' setting). (At the end of this rise, you could cover it and put it in the fridge to use the following day. It will deflate, but it's okay). Next, you want to evenly divide the dough into 12 equal portions. I do this by weighing the dough, and dividing it by 12. 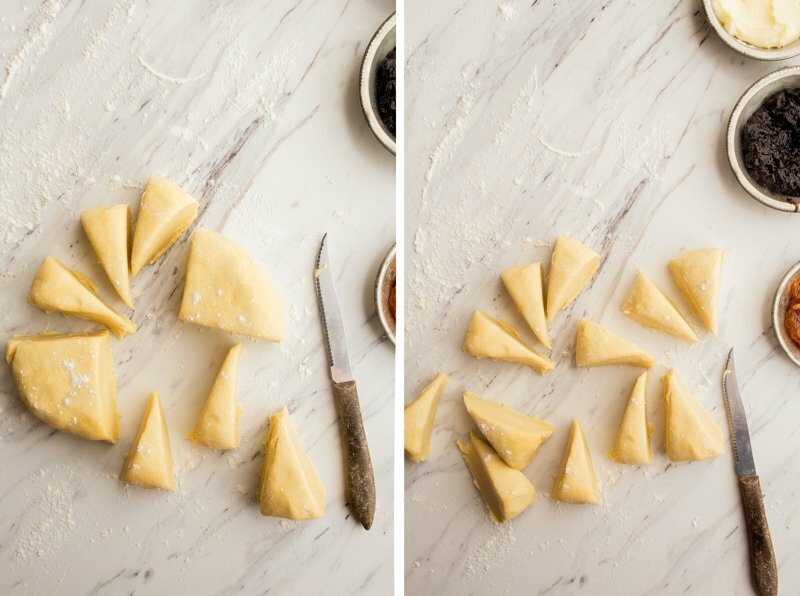 Roll each dough ball into a perfect circle (see photo). Line a 9" pie plate with parchment paper, and arrange the dough balls in it. At this point, I press gently on the dough to make a slightly oblong shape instead of a perfect circle (see photo). Let the dough rise until doubled (you can do this in the oven using the 'proof' setting). Once the dough balls have doubled in size, use your fingers to make indentations for the fillings. Go deeper than the indentations seen in the photos (the dough continued to rise while I was taking photos, making the indentations fill in slightly). Next, stir together the egg and splash of heavy cream to use as the egg wash for the rolls. Divide the jam fillings between the kolaches, and then brush with the egg wash gently (try not to get egg wash on the fillings). Bake the kolaches for 18-21 minutes, until nicely golden brown. Use a toothpick inserted into the center kolache to ensure the rolls are done. (In the testing process for this recipe, I accidentally under-baked a batch and the kolaches sunk in the middle, so make sure the inner kolaches are fully baked before removing from the oven). Let cool slightly, and then tear apart and serve. I don’t have any Czech relatives, but I have studied up on the history of immigrant communities in central Texas, which were primarily German, Wendish, Polish, and Czech families who came to Texas in the mid- to late- 1800s. The savory variant of kolaches is pretty much exclusive to central Texas, with chains like Kolache Factory spreading them out from that area over time. My guess would be that at certain times of the year, meat (especially sausage, which keeps forever) was a lot more accessible than fruit or even fruit preserves, particularly in poorer communities, so they decided to keep making filled pastries with what they had on hand. There are some cool museums that are well off the highways that contain a lot of interesting bits about the history of those European immigrant communities that settled central Texas. I definitely recommend visiting them if you happen across them – HWY 290 has a sign for the Wendish museum, if I remember correctly. I’m totally on board with Thanksgiving breakfast!! as bad, look out.) I have some of her hand written recipes, although most was in her head, and her ancient Slovak cookbook. She was amazing and I still miss her. Thanks for a trip down memory lane. I also grew up in Cleveland and my dad immigrated from Czechoslovakia when he was a baby. Both sets of grandparents were Slovak with a bit of Polish thrown in the mix. Christmas Eve was exactly as you remember but we also had homemade pierogi with prune, potatoes and sautéed cabbage fillings. My mom used to make a soup with sauerkraut, white beans and dried mushrooms too. We called it Fear Factor soup! LOL. We shared the oplatky with honey and had a variety of dried fish with the meal. My grandmother made kolachy in a long roll like a jelly roll. The apricot was the best with a big slab of butter on it. Yum!!! This sounds so lovely! Thanks for sharing your family recipes and traditions with me! <3 I love pierogi, too! What an awesome post! I’m from Slovakia (formerly part of Czechoslovakia) so I’m familiar with this type of pastry. In Slovak (and Czech), “koláč” is also a kind of a more general term, for example a pie or a sheet cake are also called “koláč”. This recipe seems similar to our “buchty” (singular “buchta”) but those have filling inside instead of on top. The dough is pretty similar to this or cinnamon rolls. “Moravské koláče” (Moravian kolache) are also common in Slovakia and they are usually round and have 4 or more different fillings on top (each quarter of the circle is different or there are multiple concentric circles of filling). “Posýpka” is basically streusel, although I think it’s usually made with a type of coarsely ground flour which is common here. I love seeing a recipe coming from my part of the world on your amazing blog. Your kolache look delicious and I love how small the batch is, I think I’m gonna give them a try this weekend! Thanks for posting this! I’m czech! I found this recept. Minna has true! Poppy filling is really good. Mill them, take suger , fride tgam a little with a some spoon of cream.. and fill with it “koláče”. The dough balls don’t arange near them, put to the bigger plate to take them more of place.. Sorry about my english, not too good. Do you have a good recipe for the poppyseed filling? My neighbor used to make them and share them. SO GOOD!!! I am totally making these! This recipe is a dream come true!!!!! Thank you so much for posting this!! Can you knead the dough using the initial knead in a bread machine or with a dough hook? Thank you.,A few fingers on each hand lock so will try that. I made your orange chocolate chip cookies. Far Better than the Tate’s cookies suggested by Ina G.
I am not usually a fan of celebrity branded products,but have you thought of putting together a set of the tools needed for baking for two? Even teaming with a store to set up a display area would be be enticing. Thank you for this awesome post! 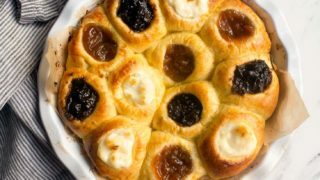 I am from Ostrava, Morava, and as other commenters we would also refer to this recipe as “buchty”, not kolache. Kolace have the filling completely INSIDE the dough, and are then flattened out. So you don’t see the filling from the outside, just a disk like pastry. Buchty are squished together in a deeper pan and come out looking like cubes. But we also put the filling inside them, not on top. But it’s the shape that distinguishes them I believe. Keep up the great work, thanks again, I am saving your website to my evernote collection to keep these recipes going in English for the kiddos. Wow! Had no idea it was POSSIBLE to make a small batch of kolache. Must try this recipe to see how it compares to Mom’s. Her family did make savory fillings, cabbage is one of her favorites. And they are in the oven! Can’t wait, the dough was lovely, it’s my 3rd attempt baking with yeast and it’s the first time the dough turn out perfect and I cudnt wipe that smile off my face :), kneading yeasty dough is fun! These look great, Christina! We went to Prague last January and they were everywhere. I was so excited because I grew up in Russia and we have similar pastries but they are called “vatrushka/vatrushki”. there are also kolaches but they are a brioche-type pastry shaped into a ring, slightly sweet and often served as a snack. It’s always amazing to me to see the similarities in Eastern European food. I literally walked around Prague trying to read all the names and guess what they were. I think my husband was first amused and then eventually tired if it! SOS please! I’m trying to make this recipe for my school bake sale but my teacher wants me to use instant yeast. How would I go about adjusting the rises and process in order to make it work? Please let me know. I am stumped. Correction! I just skipped the pre ferment, and as I wrote my question the gluten finally developed after mixing for some time. Love the recipe, especially the cream cheese. Thanks ???? I have been looking for this type of recipe for a long time. We spent years in Houston where we would find savory – sausage or ham/cheese kolaches. Can I use this recipe for savory? You just earned a new subscriber! I was just reading a Sally’s Baking addiction post for a small batch of Cheesecake and she was using your recipe and mentioned your Book Dessert for two, which is amazing as I usually bake for my boyfriend and myself. I tried kolache last year in Houston and loved them!! I tried the savory ones and then a sweet one and instantly fell in love, and since then I have been looking for an easy and a small batch type of recipe, and this is where I found you! Thanks for sharing and obviously I will be buying your book. I just found this post at the perfect time! My family also makes kolaches for Thanksgiving (and Christmas) breakfasts. This year I was supposed to make the kolaches for Thanksgiving. And then 2 days before Thanksgiving I was in a car accident and too sore and hopped up on pain killers to knead or bake. So we had no kolaches! Since I didn’t get my Thanksgiving kolaches I’ve been dying to have one and can’t wait until Christmas, but figured I was SOL because my recipe is so big. I’m definitely making this recipe this weekend so I can get my kolache fix before Christmas! Thanks so much! Thank you SO much for posting a Bohemian recipe sized to fewer people! I’m half Bohemian (my “greats” came from Pisek south of Prague) and my Gram made sweet kolaches using prune, apricot and cream cheese fillings. I can’t wait to try your recipe! I just received this post via e-mail and I live it! These look absolutely delicious and I really want to try them! These look delicious! I’d like to make them for my family when I see them for the holidays. I’m thinking making them all cream cheese with a bit of fruit together; would that work? Probably not authentic that way but the thought of the combo makes me drool. Any ideas on how to make these ahead to make them more of an easy pop-in-the-oven-first-thing-Christmas-morning deal? Yum! Do you happen to have a recipe for trdlo (spelling?) My boyfriend and I became obsessed with it when we visited Prague, but I can’t seem to find recipes and am not sure how I’d do the whole turning cooking thing anyway. Any ideas? Also, I love that you use a prune filling!!! I am also part Polish, and we have pierogies on Christmas and do traditional Easter basket breakfasts on Easter morning; my favorite foods from each holiday are the prune pierogies and the prune babka! Everyone (besides my mom, who loves them too) thinks I am nuts for liking the prune fillings, but they are just so good and really say “holiday” to me because they are what I grew up with. I grew up in a small (250) town in Iowa with a large slavic population. These wonderful kolaches were a must for pot lucks, church socials, and especially Thanksgiving. I have several recipes from the local bakers for the dough but had to research to find the toppings. I found poppy seed filling on a web site, Toriavey.com, along with several others including prune, apricot, blueberry, cherry and posipka. Is this helpful? 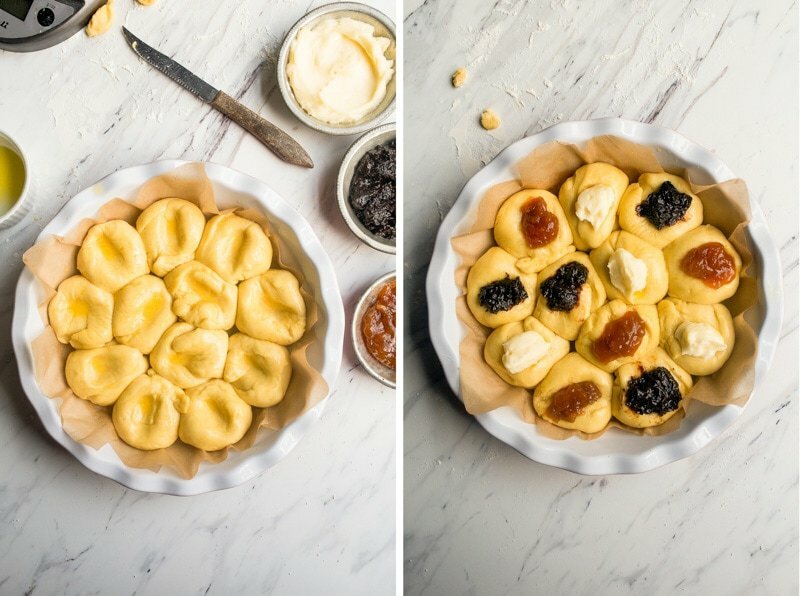 Hello Mary and anyone else interested in where to buy the filling for the Kolache. We were brought up in Illinois, suburbs of Chicago, eating the poppyseed and prune ones. Grandma immigrated to the U.S. when she was 18. She made them often. I buy mine at Walmart, Fareway, HyVee and Kroger. I’m going to try this recipe for a small batch. Yum! 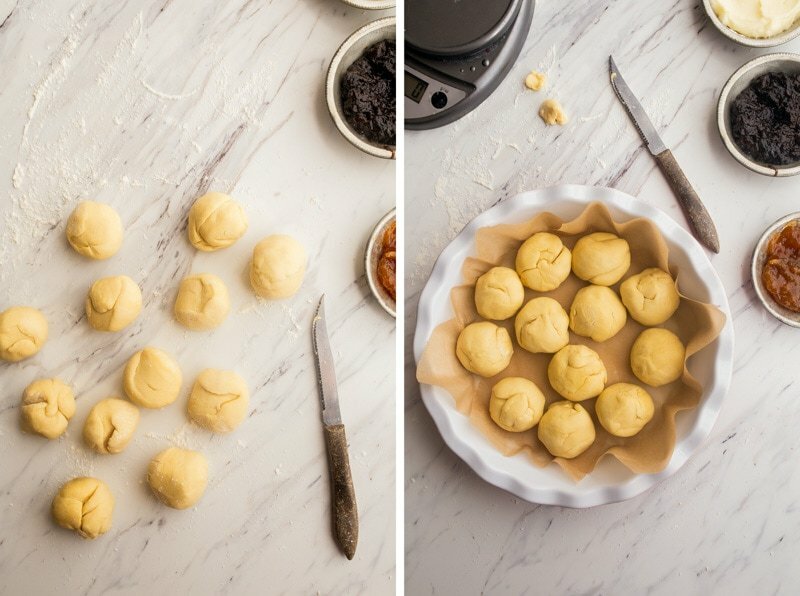 If you let your “kolache” touching each other as they bake, you are creating a unique version of Slovak/Czech “buchty” (with filling on the top rather than inside). The original “Moravske kolace” have usually farmer’s cheese sweet filing inside, then fruit or poppy filling on top with posypka. They are rounded and spread on the baking sheet with enough space so that they do not touch each other when baking. The sides where posypka does not reach can be touched by melted butter with sugar and a bit of rum before baking and shortly after you take them out of oven. I have not heard of having to make the dough rise 5 times, I let it rise only once, and then once the kolache are arranged on the baking sheet, I let them rest for additional 20-30 minutes. If you do not feel like having posypka at all, you can always use a bit of powder sugar on top while the kolache are still hot. I would like to half this so how would you half the salt? 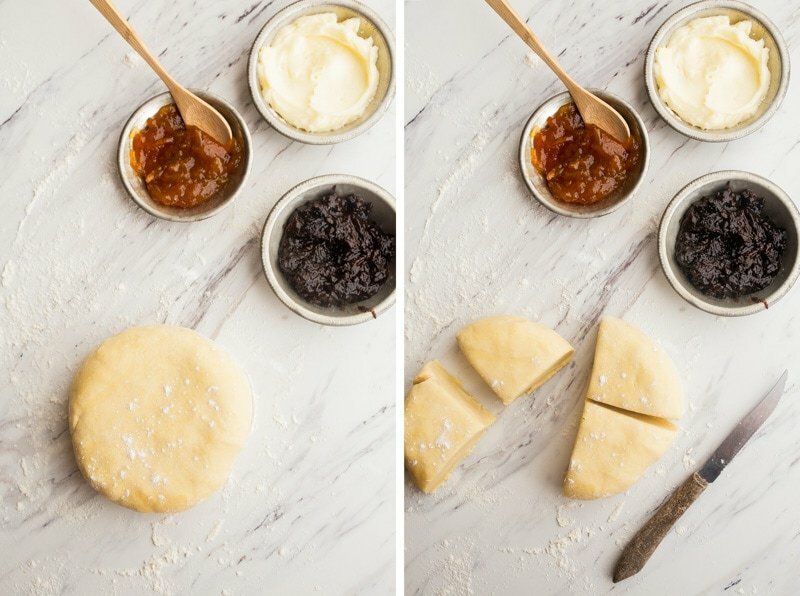 I love kolaches, want to try a savory version, after the prune,my favorite! In Kansas City and we have the Kolache Factory and I love when they make their way to the office! I’m definitely going to have to try these!! Hi there, greetings from Czech. I found your page mostly by luck on Pinterest. My family lives in Moravia and i do as well and i have to disagree, in our family this dough can be also made without any filling, braided and seasoned with salt or just few poppy seeds on the top. But i have to say, that we are not putting any salty filling inside, this one is right, i think. Basicaly, every family has its own way :) Thank you for your work here, i am deffinitely comming back for some inspiration. Do you have a recommendation for a brand of thick apricot presrves that would work as kolache filling? I have never made kolaches before. Thanks!